If you put ten people in a room who are familiar with auto restorations, whether they perform their own work, or are professionals, when discussing the challenges of restoration, the topic of repairing cast iron is likely to come up. Body rebuilding or reproducing ornamental pieces during a restoration are fairly common and usually can be achieved without too much difficulty. But mention a cracked or broken cast iron part and shivers are likely to resonate through your body. Cast iron, a ferrous metal containing approximately 95 percent iron with the remainder being alloys such as silicon and carbon is often used for many vintage auto parts. It casts well into a shape, is easily machined, is ideal for high heat situations (like exhaust manifolds) and even has good compression qualities. Cast iron however doesn't do well under tension and is brittle. 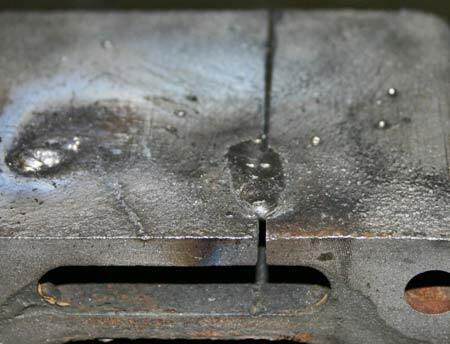 A repaired crack in a cast iron part using conventional brazing techniques is likely to reappear when the part is put back into service, particularly if the part is usually under some sort of stress or load. Traditionally, dealing with a crack in a cast iron part called for preventing the spread of the crack. Closely spaced screws screwed into the root of the crack heads ground off could achieve this goal. Better is repairing cast iron to join the broken surfaces and prevent further cracking from occurring. This article focuses on the repair a model L Lincoln cast iron water pump, but it also applies to repairing cast iron in general. While disassembling and separating the front and rear halves of the water pump, the flange surface of the rear half broke. This probably occurred because too much pressure was exerted on just on one side of the flange. In hindsight a better way would have been to first soak the shaft and bearing/packing areas and then gently press on the shaft and impeller to separate the halves. But it can't be undone and must be repaired. 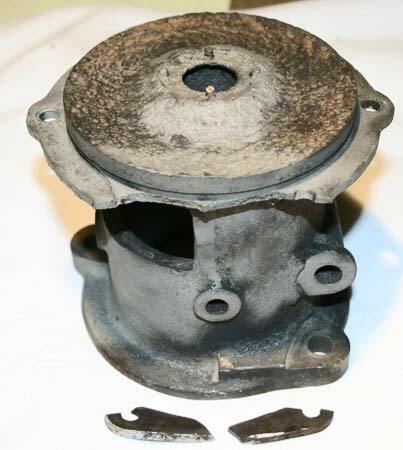 Water pump cast iron part, after bead blasting, showing the pieces broken from the flange. Repair of the water pump's cast iron flange was brought to the attention of a previous acquaintance, Cecil Muggy, a metallurgist with a career at The Boeing Company. Muggy Weld, a specialty welding supply house offered a line of welding and soldering products for difficult welding problems like our water pump housing. They offer two grades of electric arc welding rods, #72 for heat-affected cast iron, typically used on parts such as exhaust manifolds. (The heating of cast iron to high temperatures changes carbon content as well as the handling properties of the cast iron. Cast iron that has been used under these conditions is sometimes referred to as dirty cast iron because of the carbon content.) The #77 rod is used for "clean" cast iron which also can be machined. When repairing dirty cast iron, the #72 rod is applied first to fuse into that grade of cast iron and "topped" over with a few passes of the #77 rod. Only the #77 rod can be machined or ground and this can be useful when finishing an exhaust manifold which will be top coated or porcelain coated. Muggy's claim is that their cast iron rod has 300 percent more elasticity than standard nickel arc welding rod. It is this elasticity that works to prevent further cracking. They also claim that preheating of the area to be repaired was not necessary, though experiences have varied here. Before trying to weld the water pump, an old marine cast iron manifold was retrieved from the junk yard for practice welds. 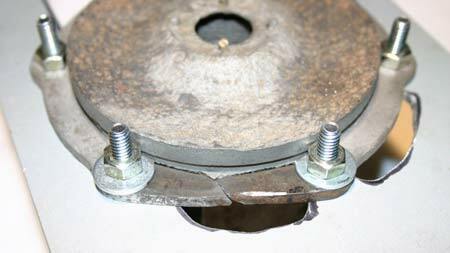 Several cuts were made using a die grinder and cut off wheel simulating crack areas and then lightly Vee'd out as is customary in performing deep welds. Using an electric arc welder at about 90 amps, negative polarity, and a back stitch method, the rod penetrated the scrap manifold well. Diagram of performing a back stitch arc welding technique. Scrap marine cast iron exhaust manifold used to practice. A thin gap was cut using a cut off wheel simulating a crack and slightly Vee'd out. Two passes over the gap proved the rod would penetrate and fill the gap. Cross section view of the same practice manifold. 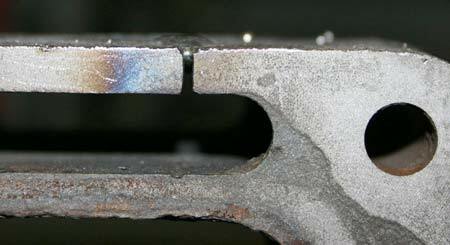 A wider Vee would have permitted the weld to be more in the middle of the cast iron material. In one small area a hairline crack appeared across the stitch where the practice manifold had two different thicknesses. Going over the area again with another pass corrected the hairline crack. In this case, some preheating using an Oxy Acetylene torch may have prevented this from occurring. These practice welds convinced us that these arc welding rods would solve the water pump flange problem. The water pump housing and flange pieces were bead blasted and a thick aluminum plate jig was fabricated to hold the flange pieces during welding. 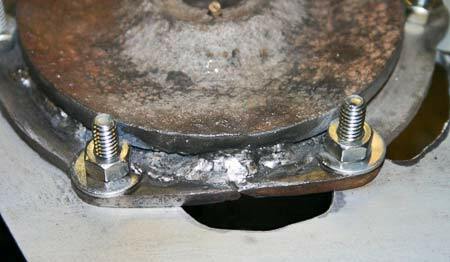 Again using the back stitch method, short welds were applied on both sides of the broken flanges to ensure deep and even penetration. Afterward, the jig was removed and the welds were machined using pneumatic and rotary tool carbide grinders. Also, the #77 cast iron rod was used to build up heavily corroded areas around the pump's water outlet flange. Water pump cast iron part bolted with a thick aluminum plate as a holding jig. First welding passes are completed on both sides using the #77 welding rod. Aluminum plate is unbolted and the remaining flange area is repaired. 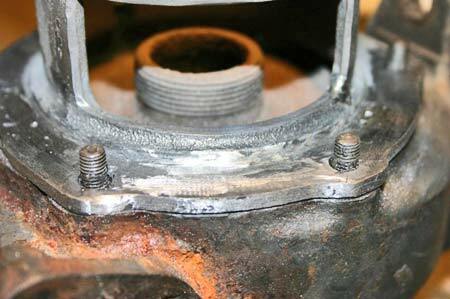 Repaired flange surface is machined, ground, and fitted to the water pump housing. 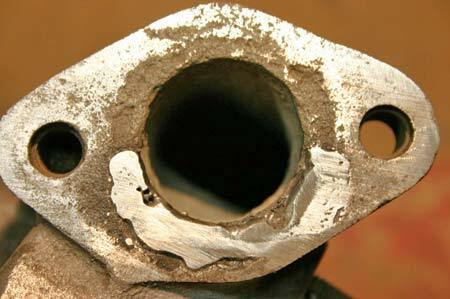 The water pump's pipe outlet flange shows the extent of corrosion and areas filled in using the number 77 welding rod. After a few passes and some filing, it is clear the welding rod will build up the surface suitable to make the outlet a water tight joint. Repairing cast iron has historically been difficult. However these welding products may offer solutions to once un-repairable parts such as the bottom edges of cylinder blocks or inside water compartments that cracked from water freezing. Muggy Weld offers many products and their website offers a great deal more than can be explained here including valuable video tutorials.